No wonder Rahaf Alqunun chose Canada. 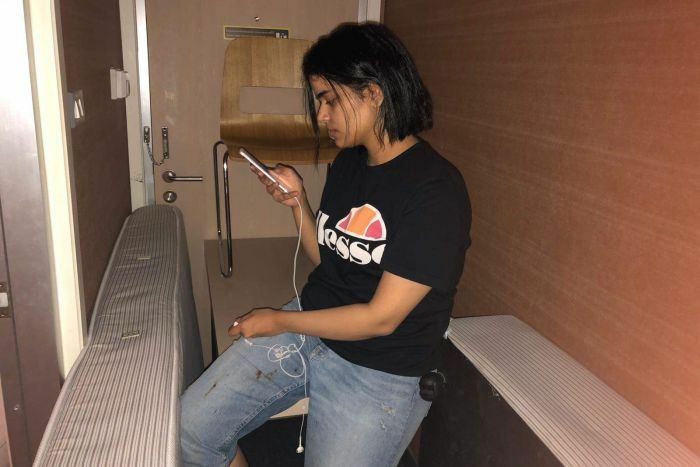 The Saudi teen who escaped the punitive Saudi Arabia and her abusive family has chosen to accept the Canadian PM Trudeau’s welcoming offer to travel to Canada and right now is on a Korean plane. I suppose the moaning by Australia, especially by the Dutton potato face must have put her off. There were calls for her not to be allowed ‘queue jumping’ and that ‘proper course’ would have to be followed, must have given doubt to this teen about the Australian stance on refugees. No doubt as an educated girl she would also have known about the terror of Manus and Nauru. Another nail in the coffin for Australia’s reputation as a country that fights for human rights. This entry was posted on January 11, 2019 at 10:12 pm and is filed under Gerard Oosterman. You can follow any responses to this entry through the RSS 2.0 feed. You can leave a response, or trackback from your own site. Yes, Canada has shown that it does, outwardly at least, have a more humane stance on matters of this sort. Good luck to this young lady. And now, I wonder, what’s happening to the soccer player marooned in Thailand? Marise Payne is apparently ‘negotiating’ but as far as I’m concerned, his situation has gone on far too long. Australia had a wonderful opportunity to gain back some good international reputation by quickly assuring this girls safety and bringing her to Australia. It chose not to! As always, a smarter PM. Mr Trudeau, took the opportunity to gain the upper hand in taking swift action in granting her a visa, while here in Australia a sullen and backwards looking PM Scott Morrison refused to even respond to questions why her application was being dragged along for days when her safety was being compromised in Thailand. ” Ms Alqunun went to the Australian embassy in Bangkok on Wednesday and completed the visa application. But Australian officials confirmed to the ABC that her case was still being processed as of late Friday. Meanwhile, there was growing concern within the UNHCR over Ms Alqunun’s security as she remained in Bangkok. Ms Alqunun, while being overjoyed at being safe and headed to a third country, had still hoped to come to Australia where her close friends are. Something VERY DRAMATIC will have to be done if Labor gains office to look into that department’s behaviour and record…along with so many other “corrupt” authorities….it’s so eye-wincingly sad! I think Dutton will make sure she is not using Canada as a backdoor into Australia. I’m surprised people still want to come here voluntarily. Haven’t they. heard of Dutton’s black-shirted goons? Very good, Peter. I hope I will live long enough to finally see Dutton being dealt with. I am not vindictive normally, but try as I might to see him in a reasonable light, I must confess I keep getting those dark thoughts. She is clever. It would also not have been easy to break from her family, even an abusive one. She is from a family with ten children. She is now safe in Canada. She is now safe in Canada and was greeted with a bunch of flowers. There are still over 1200 people languishing on the far away islands of Manus and Nauru, totally isolated and now going into their 6th year of detention. The majority have been deemed to be genuine refugees. I sometimes think my dad should have gone to Canada instead of Australia. Mind you Australia was far more welcoming in earlier times although putting migrants in far away camps was then normal as well. There is something punishing about Australia, I have yet to put my finger on why that is so. And kudos to Canada, Gerard! Canada showed that compassion pays for itself. Australia is now seen as being surly and slow when it comes to taking action. ” There is something punishing about Australia, I have yet to put my finger on why that is so.”…….. There is a class of people in Australia..a class that was educated in the belief that THEY represented, if only in their own tiny vanities, the ruling aristocracy of the United Kingdom…You see their names on country towns, rivers, streets of major cities..anywhere they could implant their imprimateur that designated that THEY were the founders and builders of this “Empire in the Sth Pacific”….and like any cluster of fools, the only way they can “cement their authority” is by acting out THEIR theatrical version of tyranny against those more vulnerable..
Australia is moving toward the close of an era with these fools trying to make a last-grasp attempt at relevency…and if they are not totally decimated in the next election…NOT only because thay have no vision for the future, but more importantly because they have such a disgraceful record of their past actions…then the nation and the people will go down together in deserved ignominy. And I think I will move back to Italy! We have had visiting family and medical journeys preventing quicker replies, Jo. Punishment and severe punishment well above the norm drove Australia to overcomes those first few decades of colonisation. When early squatters were given land rights the term ‘squattocracy’ was coined. With time they became rich and they started to Lord it over others. They became well known families who names till this day still hold power over the less well off. Private schools, that dreadful educational system inherited from England takes care that this division will stay on forever. Patrick White understood this very well and till this day he is still somewhat vilified in his disdainful way of writing about the ludicrous way Australian society evolved. One would have thought that Australia with its multitude of foreigner born had evolved a progressive mentality instead of the present stodginess and relishing forever in what has been. ” I come into this conversation late as last night I was doing my best to avoid the study as that is also where the tele is and my better half likes to watch Q&A…and I can’t stand it!….So I came in about where someone was querying evidence of refugee status of the young man involved. Many names we here in Aust’ now are familiar with were refugees from oppression back then..Names like Lehman, Modra, Koch (ie), and many others were Wends or Sorbs of Slavanic extraction, not German…some of these names were changed to disguise their original location identification…umlauts were dropped off, vowels or consonants changed or moved..and one never carried papers that could positively identify oneself if you travelled to the west for work as many pogroms were happening where you could be murdered if you had the wrong name…one case was a relative who travelled to Gdansk for work in the shipyards and was murdered because his name identified him as eastern German.. another migrant from after the war I grew up with had a letter removed from their surname as it could be mistaken for a Jewish surname by the Nazis..and on it goes..